November | 2013 | cut it out, stitch it up! 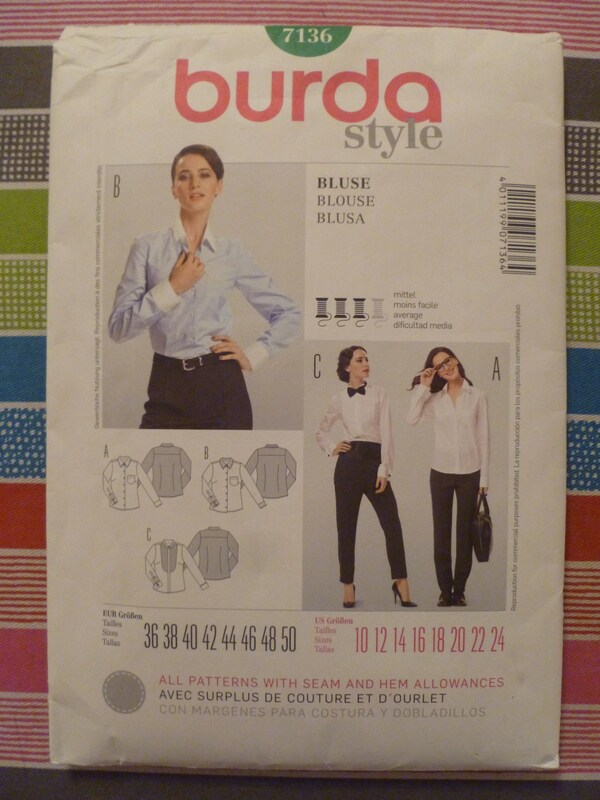 Burda Style 7136 Denim Shirt Finished! 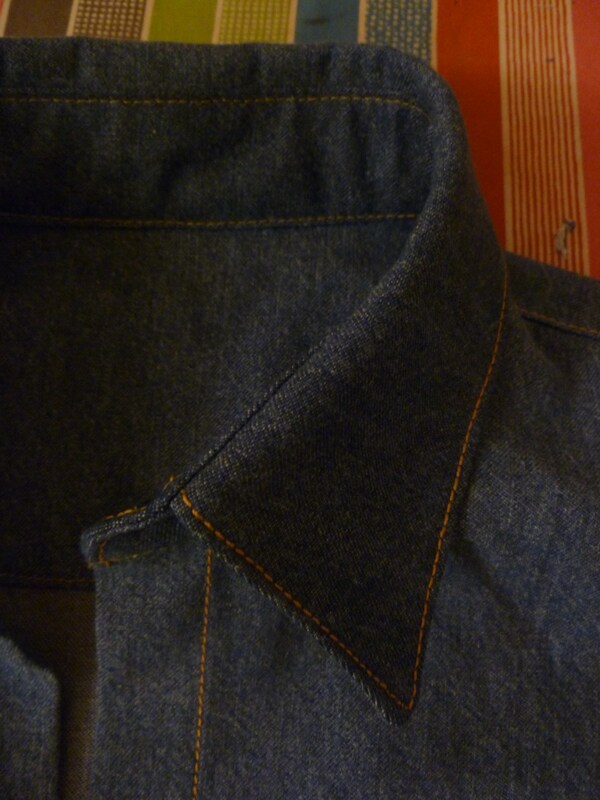 The denim shirt is now finished after two final very frustrating evenings of sewing. Firstly I had topstitching issues, it took ages to thread the needle and when I finally started sewing threads would get tangled up on the back. I even managed to run out of thread. 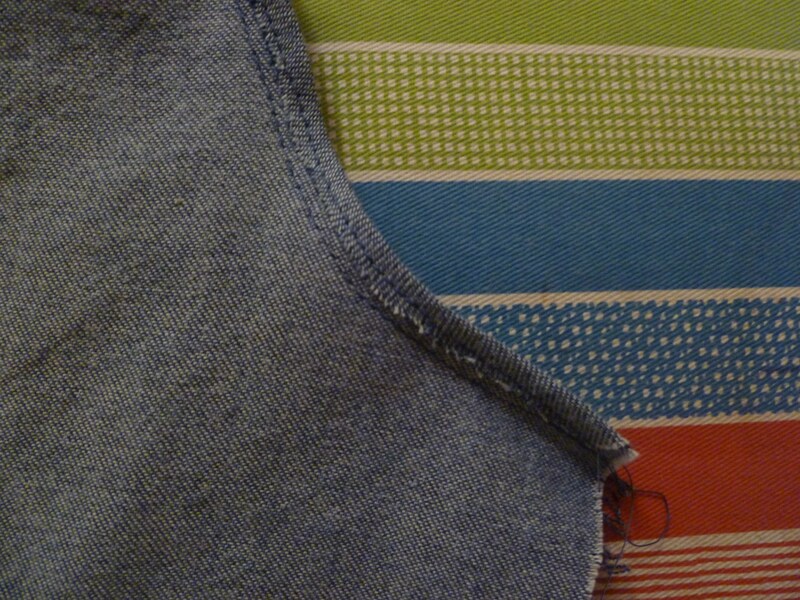 I was sure I’d have enough to stitch the whole seam. Luckily I had bought 3 reels. I gave up on the idea of flat felling the underarm and side seams. There was too much fraying going on. In the end I trimmed one side of the seam allowance down, folded over the other side, stitched in the seam allowance and then pressed to one side and topstitched. When I was packing up at the end of the evening I realised I had been using a no.11 topstitch needle rather than the 14. I think this was the problem with getting the thread through the eye as when I did use the 14 threading was fine. I was just wasting loads of thread with having to snip off a few centimetres each time it untwisted with a failed attempt of thread and then all the unpicking… with only 30mts on a reel it just seams to disappear. 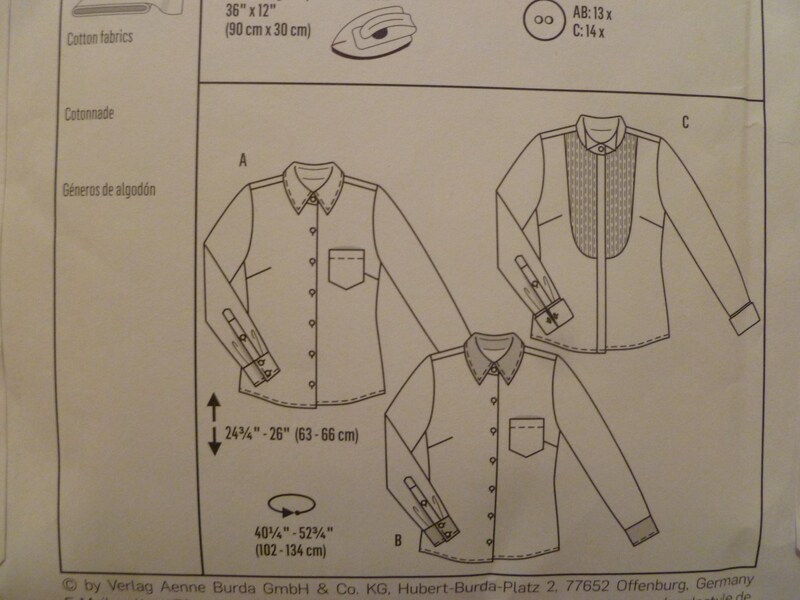 The second evening of frustrating sewing was due to the button holes. The night before I had added them to the pocket flaps and they were perfect first time. 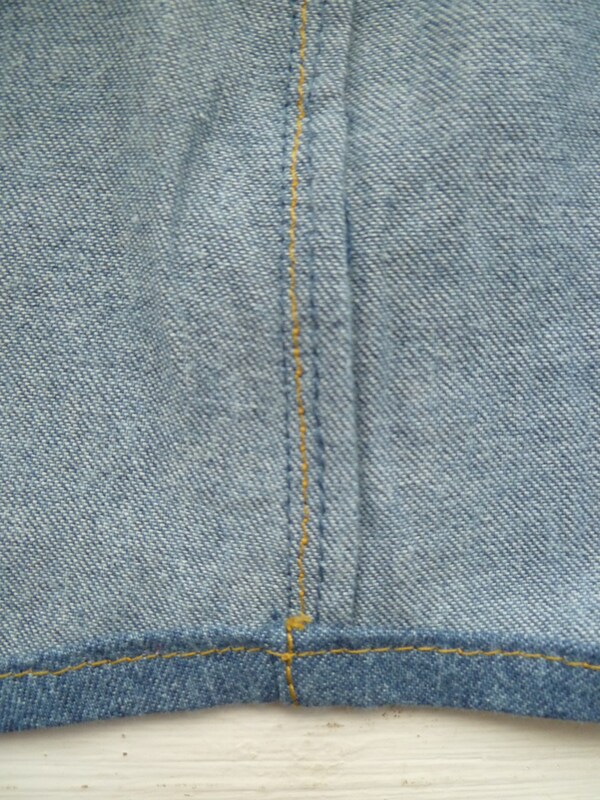 Now the 1 step button hole on my machine would only stitch one side of the button hole. After about 45 minutes and numerous attempts it started working again. But the stitching of every single one was stressful as I was expecting the machine to play up. Also sewing on the 13 buttons seemed to take an age. Now it is finished I LOVE it. I want to wear it every day. I’m happy with the fabric, the buttons, the topstitching and the fit. I didn’t make any adjustments to the fit except that I had to trim the length of the sleeve down by 2.5cm and I reduced the depth of the cuff by 1cm. Because my bottom edge of the sleeve was now wider I had to increase the size of the pleats so that wasn’t too big for the cuff. 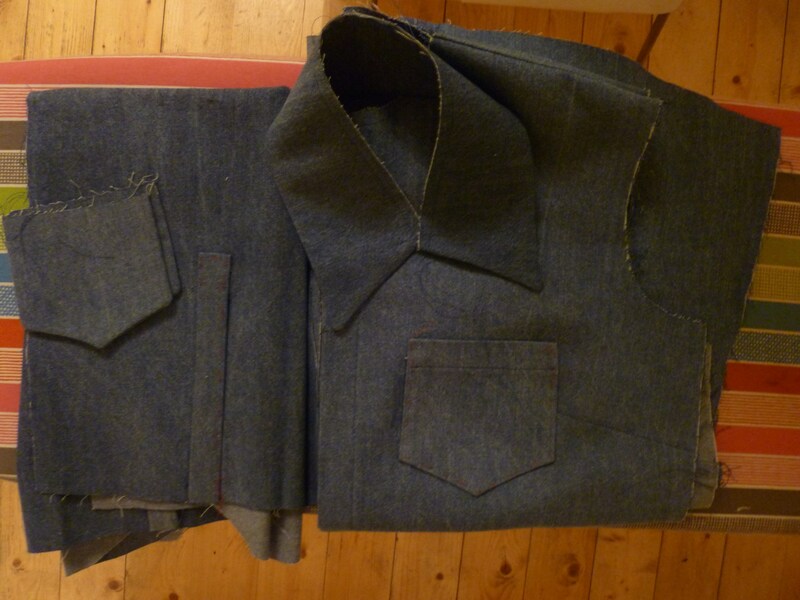 Also I lost 2.5cm in the length of the cuff placket and with a narrower cuff only used 1 button rather than 2. 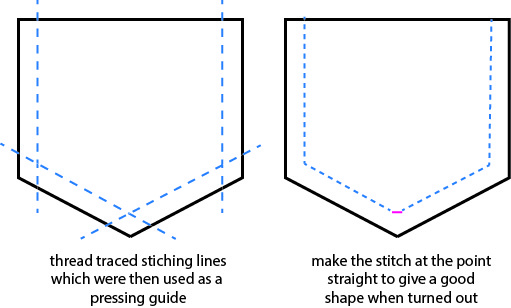 So if I make this pattern again I’ll take the length out of the sleeve pattern before I cut the fabric out. 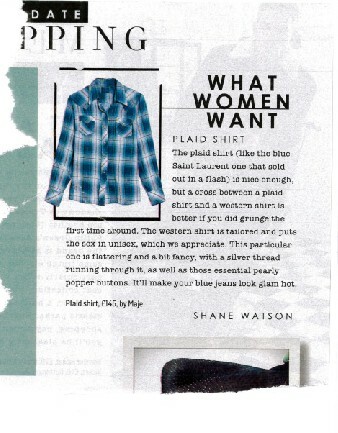 I saw this shirt below in the Sunday Times Style magazine, ( I scanned it and now I can’t even read who it is by….) Checked / Plaid shirts are everywhere at the moment, I do have Boden one which after 3 years and a lot of wear is beginning to go at the seams so I think this will be a new year project using this pattern. 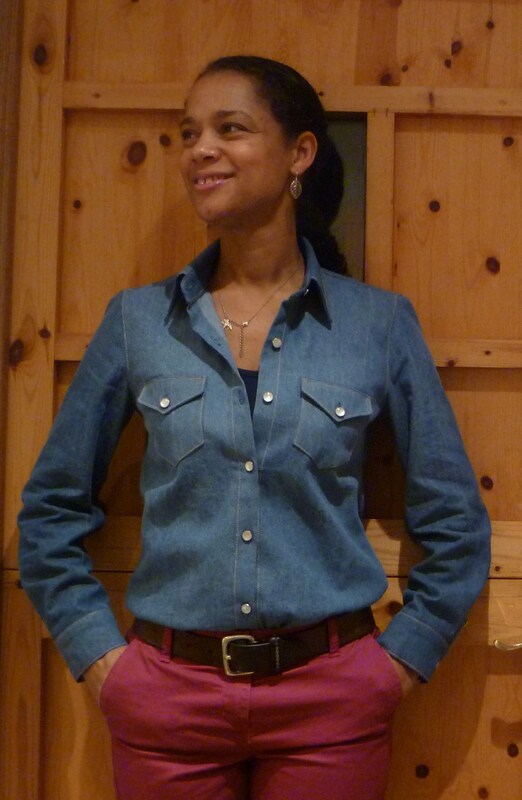 I’ve been thinking about a denim shirt since the beginning of the year and it’s taken me till November to get around to it. 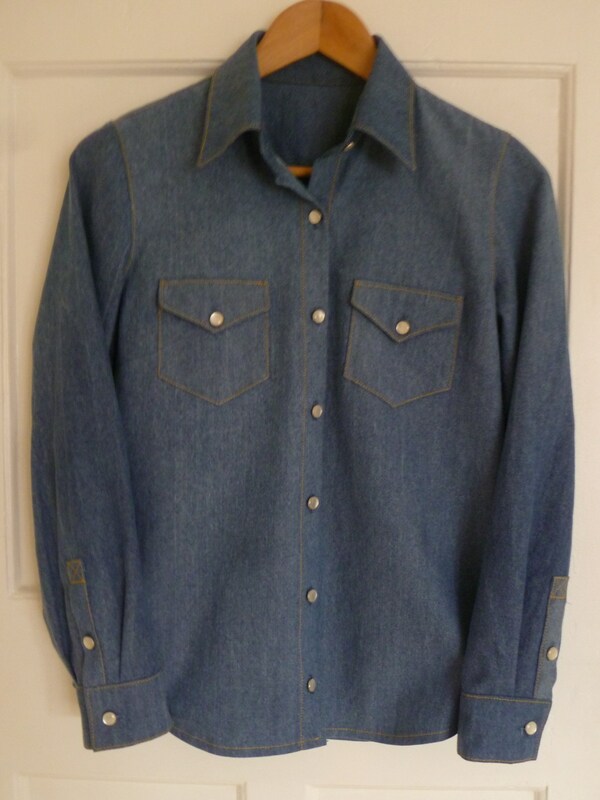 I found the lightweight denim at Ditto Fabrics, I was able to get a swatch first just to check it was the right weight for a shirt. The fabric was described as being ‘distressed’ but when it arrived some areas were a bit more distressed than others. 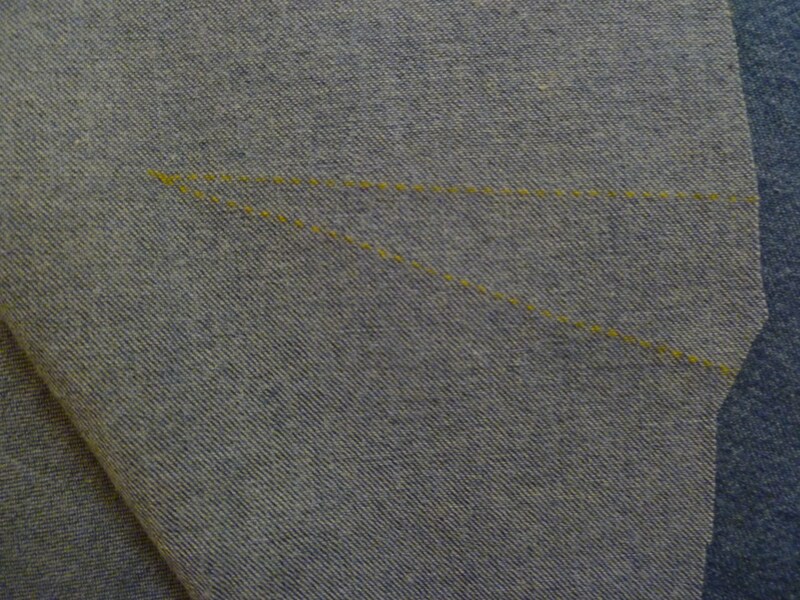 There are some quite prominent lines but I’ve been able to cut these near the sleeve seams. 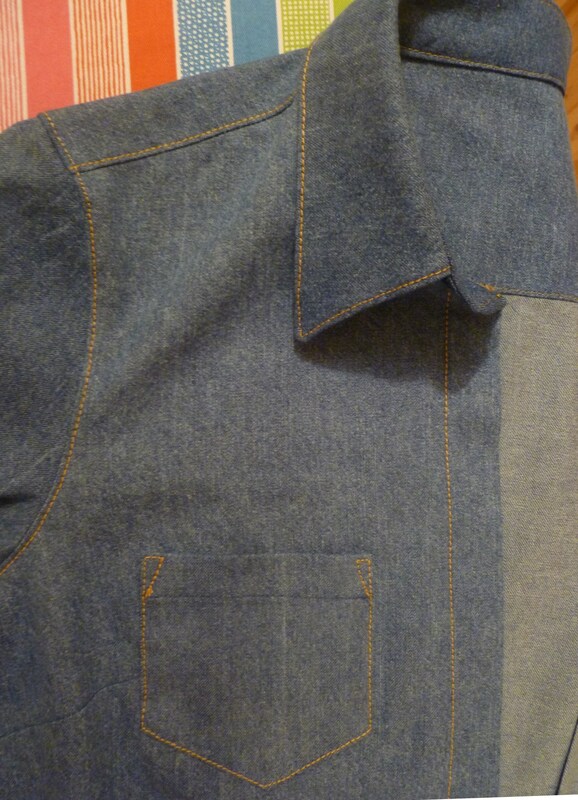 Tacked sleeve placket along with pocket and flap. The ‘distressed’ line looks more prominent in the photo than real life. When I was transferring the pattern markings I used yellow wax paper. This stuff is great. It doesn’t seem to be available in the UK so I ordered from A Fashionable Stitch in the US. 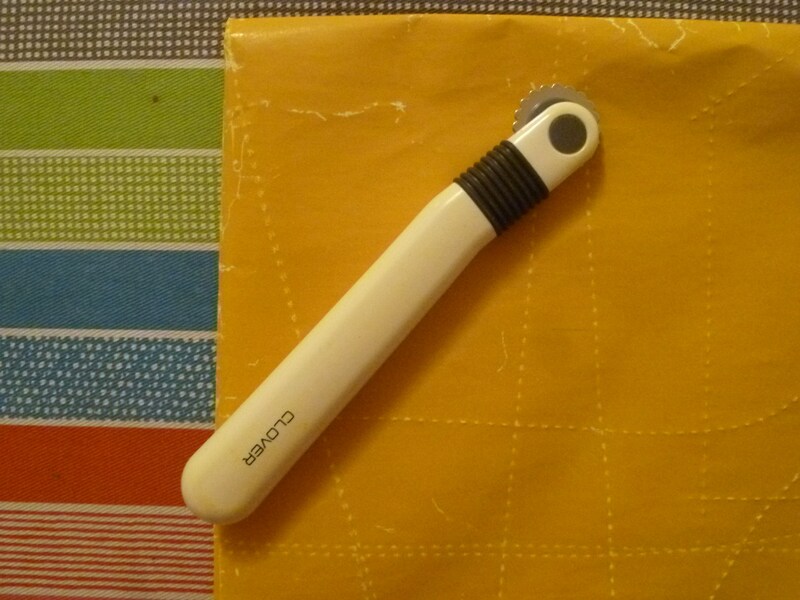 You use it with a serrated edge tracing wheel (not the spiked) and it leaves a perfect mark, but obviously not suitable for all fabrics. Sewing is on hold at the moment as I need to buy some topstitching threads which I should be able to do tomorrow. I recently read a great post on topstitching by Yes I like That, 20 tips and before I start I’ll be re-reading all of them. There was a comment on pattern for the first pair of socks I made ‘WARNING sock knitting is highly addictive’. I think it’s true. I feel like I know how to improve on the first pair and want to prove to myself the next pair will be better. 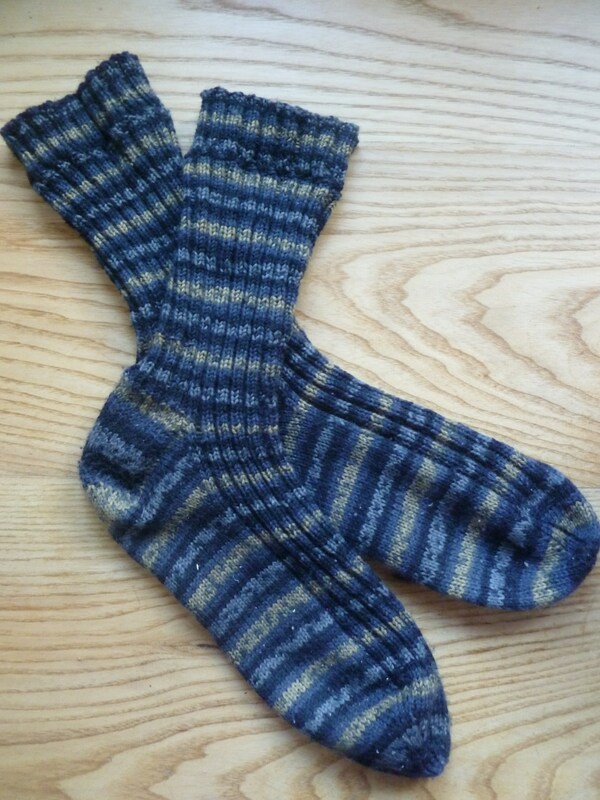 I’ve knitted a pair for my other half using the same yarn from Love Knitting, 75% wool, 25% nylon 4 ply sock yarn but in a different colour. I love the way the stripes knitted up. The pattern was free download from Ravelry, Rams Wool Basic Socks I picked it mainly because it was simple and sized for men. I think when it comes to socks staying up rib is the way to go. So the leg and instep are knitted in 2 x 2 rib, which gives quite a skinny looking sock but compared to stocking stitch has much more stretch. The heel, toe and under foot are stocking stitch, actually the heel was a repeat of *k1 slip1* which in itself gives a bit of a rib appearance. There is probably a good reason for this; I think it makes the heel thicker in an area that gets a lot of wear. I feel like I am getting the hang of grafting the toe ends together, no knobbly bits this time around. What I really loved about this pattern was the instructions on how to split the stitches between your 3 needles. This is probably basic stuff for a seasoned sock knitter but for me it was a light bulb moment. On my first pair of socks I just divided the stitches evenly between the 3 needles and had to use fiddly stitch markers. This pattern explained to have half the number of stitches on 1 needle and the other half split equally between the other two needles. 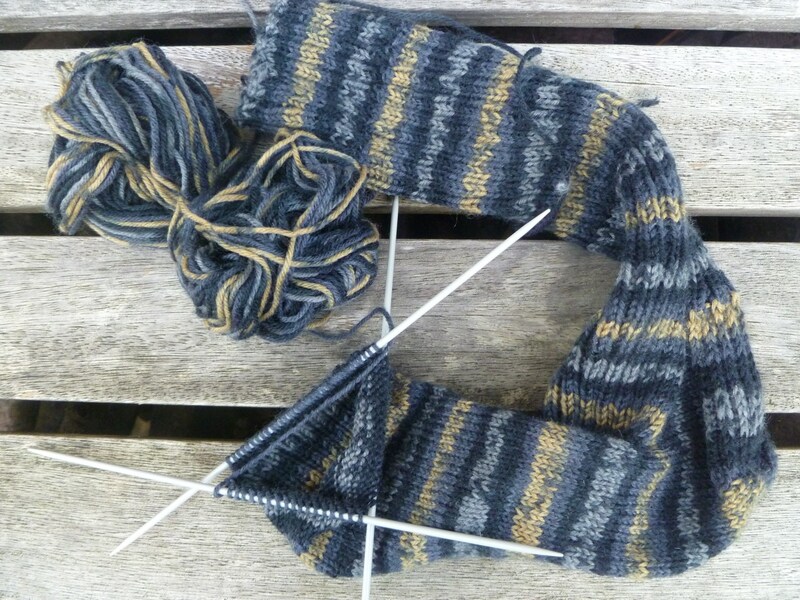 This remains constant throughout the sock (except when the amounts increase and decrease when you are turning the heel). When you are knitting the ankle the 36 stitches are the back of sock and extend down to the heel. When you are knitting the foot the stitches get shuffled around and the needle with 36 stitches forms the instep. The first pair I knitted for myself now look a bit basic in comparison, so I’m starting another pair for myself in rib with a bit of cable thrown in.